The gameplay looked simple enough. Notes come down the track, similar to Rockband, and you smash the corresponding key to the rhythm. Sometimes you hold the note, sometimes you just tap the note. Simple enough. 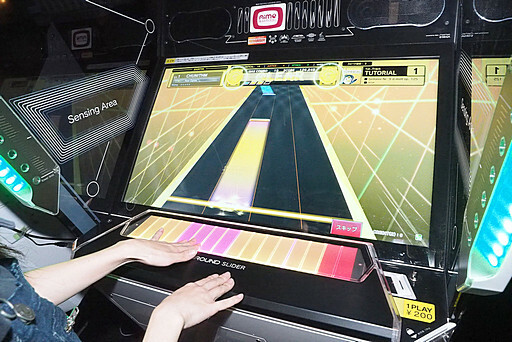 The innovation was the “air slider”, where you sometimes have to bounce your hand a bit after hitting the note into the air, and sometimes you have to hold your hand up to the sensor, and sometimes you have to bounce your hand in the air for the sensor. The basics seemed simple enough, and like any music game it’s first about getting used to the machine and its mechanics, the music is ultimately secondary to just getting used to the mechanics of the game. I picked up the pace from easy to expert fairly quickly, in about 2 games worth and the real appeal didn’t really hit me. 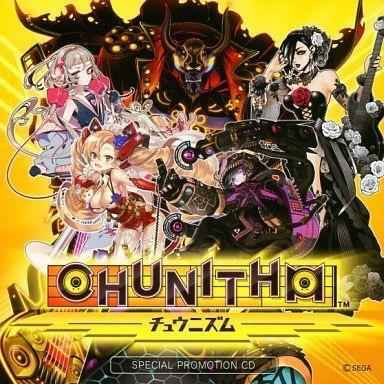 The game just felt like a means of listening to Vocaloid versions of popular Japanese songs. The “Air slider” was new and definitely helped make the game stand out from the generic button-mashers that you typically find in the rhythm-game genre. There were also level-tracking systems and weekly events to keep you coming back regularly, taking the learnings from “visit daily” mobile games to keep the game under the player’s weekly habits. Characters have special powers for score boosts, life-bar boosts and other challenges to make sure you have plenty of reason to level up each character. You also need to play to unlock new songs, making sure that the player always has something new to work towards and always keep this knowledge transparent to the player so they have that “just one more quarter” mentality to unlocking something new that games like WoW are used to delivering. Bringing the “best” user-retention techniques to your game, right? There was something off with my thinking though, and I knew I was missing something. These machines found in every arcade in Tokyo was always crowded with a wait, 3-4 people always in line to get their hands on the machine. I had to keep playing, to find out what they must’ve found addicting about the game. Every SEGA music-game in the building has a similar tracklist, it can’t just be a glorified jukebox, could it? It was then that I realized that some people weren’t playing with a similar HUD to Expert mode… Their game said Master Mode. I had a new goal in hit. After a few more games I had unlocked a song with Master Mode, which required an S rank on that song. It was disheartening that it wasn’t just one S-rank song to unlock all Master Mode songs, but I guess I can see the rationale behind it. If you don’t know a song well enough to S-rank it on Expert Mode, you probably don’t know the song well enough to play it well in Master Mode. It was at this point where the game finally clicked. I wasn’t just smashing notes to the beat of the song. It was a transcendence, to finally understand the appeal of the game. You’re “playing” the music but also moving along to interpretations of the song. Like finding a step-chart for a DDR song where you movement seems to fit a song better where you aren’t just moving to the beat, but the holds and the double-steps, the rolling triplets, and twists and spins feel harmonious to the song that you’re playing. 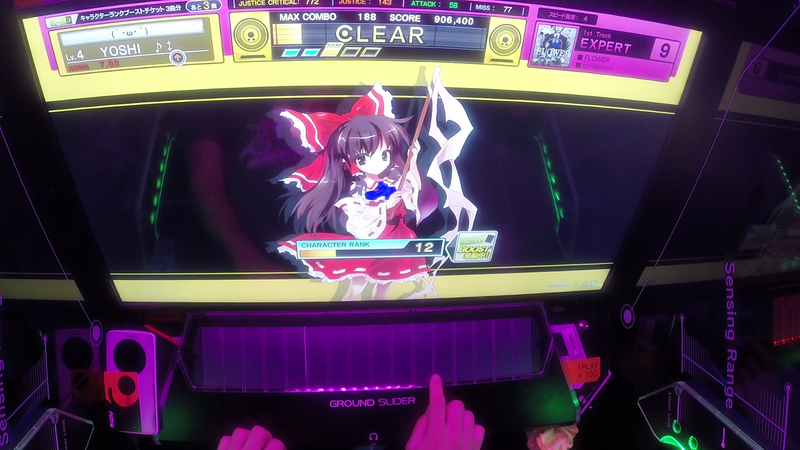 It was only at this point when I started having fun with the Chunithm. You could say that I finally found a my home between Skill and Difficulty where Flow was achievable, but I still think it’s more than that. That I found the real reason to play this game, and that all other modes before Master Mode was just a means to prepare the player for Master Mode. It’s not all games that truly open up at its hardest difficulties, but for music-games in particular it requires a strong synergy between sight and sounds and fluency with your instrument. A core reason why rhythm games will be my mistress and I’ll always be hunting for the next model to trial, regardless of what new Metal Gear Solid, Team Meat or Naughty Dog game gets released. 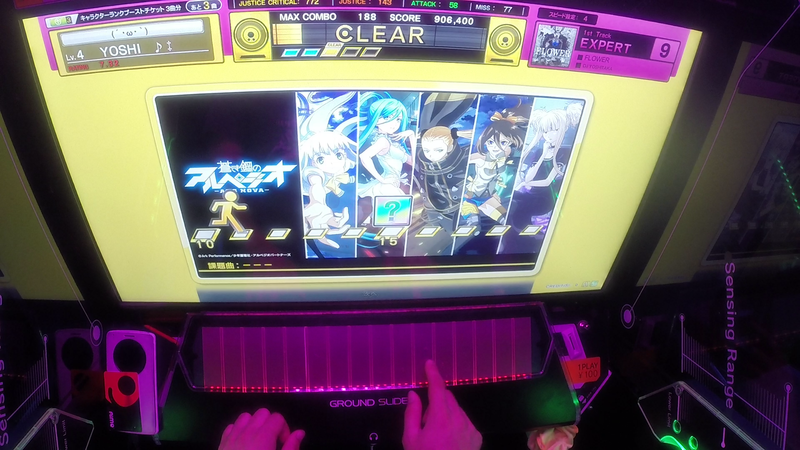 Chunithm is a rare game that takes a while to become fun, but quickly becomes an addiction when that fun arrives. Enough so that I kept playing up until my last moments in Tokyo. Until the day this game may show its cabinet state-side, and the addiction can continue. How do you get the card to have an account for the arcade games? 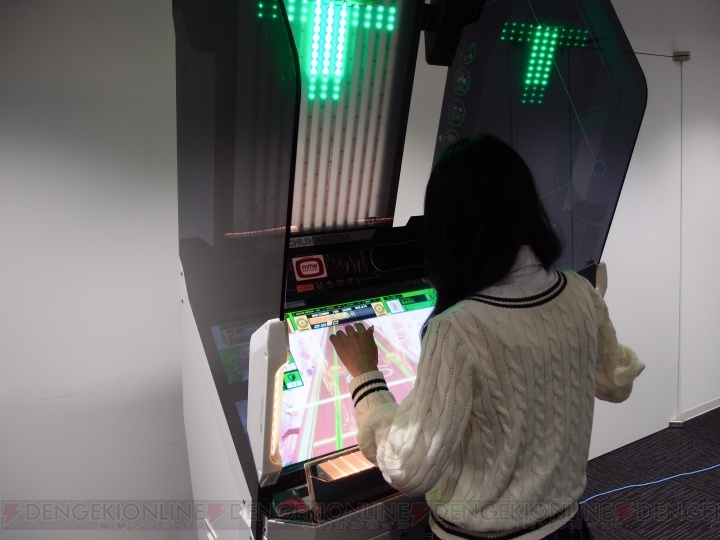 You can buy Aime cards the most arcades (like Round 1 or Sega Arcade) that the cabinet exists or other Aime compatible games exist (Rev is another which uses Aime). You just need to ask one of the workers.